And here’s how it’s looking now! 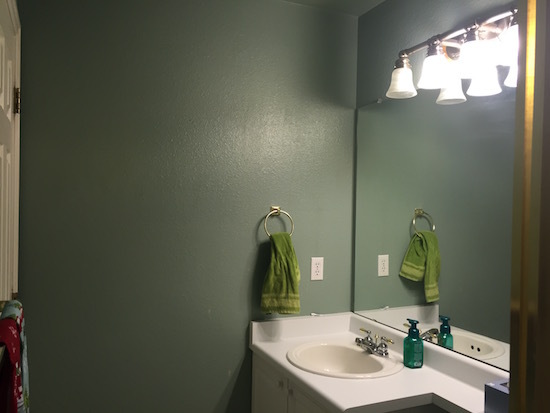 The bathroom still needs a full overhaul, but the green is gone and the room is much more soothing now. 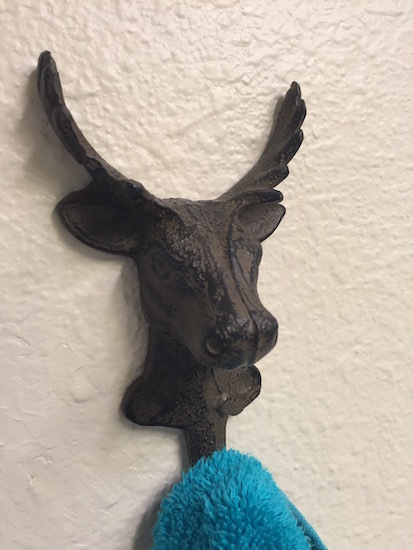 Check out this adorable little wall hook! I will never tire of my love for animal heads. 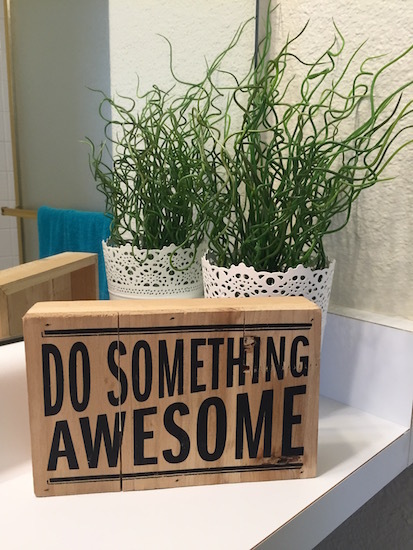 I found this “Do Something Awesome” sign and of course had to get it. AWESOME is my favorite word, after all! Wow! Dark-hole to clean-and-bright! 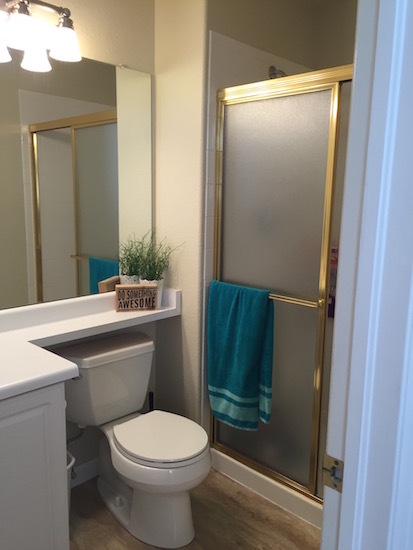 We’ve been working on one of our bathrooms the last week+, achieving the same results. 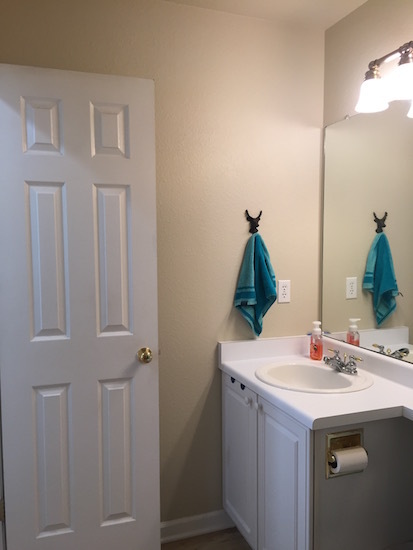 I’ve had your TX house kids bath pinned for that one for a while now. Light neutrals are SO restful after a too-dark color!!! I agree! I love light neutral paint. It’s just so inviting and bright. 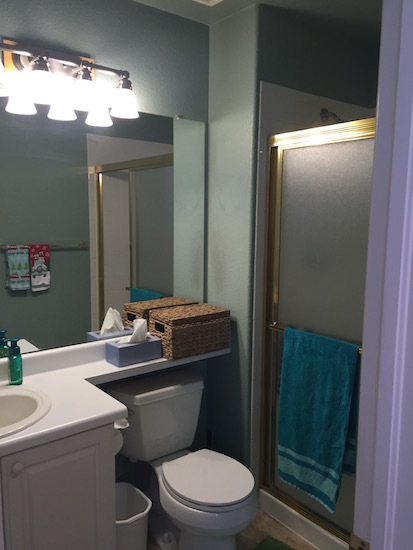 I miss that bathroom. I need to add some beadboard here! Beautiful transformation (as usual) and, awesome, too! Thanks so much! It really is so amazing what paint (and nothing else!) can do! Looking good Allison. Keep us updated! Without a doubt, paint and light can do wonderful things with your space. Amazing what a little paint can do! 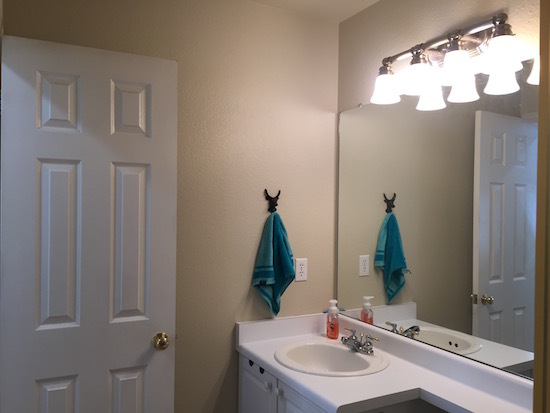 Love the wall hook! So I’m having some painting issues. The house we bought a year & half ago has previous smokers. 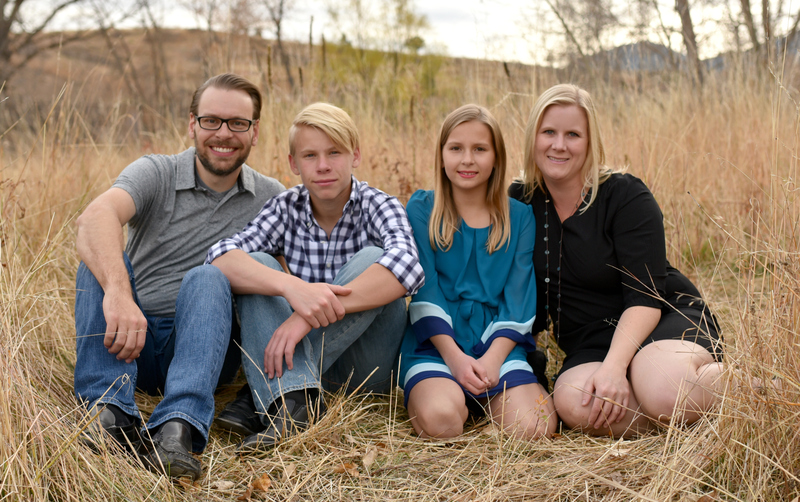 I’m trying to figure out if the smoke is my problem. So I have wiped down all rooms I’ve painted with TSP or Dirtex then applied Kilz 2 primer & than painted with paint & primer in 1. I was hoping by using kilz it would help with any smoke odor. We have a 2 level house & the kitchen & 2 bedrooms when the walls get nicked the paint will peel off down to where I primed. I pretty certain that previous paint used was latex & not oil because it was left with the house when we purchased. The only thing I can come up with is moisture the house or from using paint & primer in 1. I have used 2 different brands so it can’t be the brand. However, my entry way & living room upstairs doesn’t seem to have this problem. Just trying to get to the bottom of this issue as I have 2 more rooms up stairs & the entire down stairs to paint. I know downstairs there was a window issue but we replaced the bad windows down there now. So seeking advice to my issue:(. what a transformation! It’s amazing the impact a change of accessories and a lick of paint can do, especially when you have a good eye for colours that complement each other.